Objective. 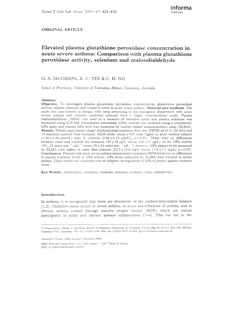 To investigate plasma glutathione peroxidase concentration, glutathione peroxidase activity, plasma selenium and oxidative stress in acute severe asthma. Material and methods. The study was case‐control in design, with cases presenting to the emergency department with acute severe asthma and controls randomly selected from a larger cross‐sectional study. Plasma malondialdehyde (MDA) was used as a measure of oxidative stress and plasma selenium was measured using ICP‐MS. Glutathione peroxidase (GPx) activity was analysed using a colorimetric GPx assay and plasma GPx level was measured by enzyme‐linked immunosorbent assay (ELISA). Results. Fifteen cases [mean (range) predicted peak expiratory flow rate (PEFR) of 43% (20–69)] and 15 matched controls were recruited. MDA levels (mean±SD) were higher in acute asthma subjects (1.30±0.56 µmol/L) than in controls (0.86±0.53 µmol/L; p<0.05). There were no differences between cases and controls for selenium (99±34 µg/L versus 109±17 µg/L) or for GPx activity (39±25 nmol min−1 mL−1 versus 38±24 nmol min−1 mL−1), however, GPx plasma levels measured by ELISA were higher in cases than controls (22.5±10.8 mg/L versus 13.8±7.3 mg/L; p<0.05). Conclusions. Patients with acute severe asthma demonstrated increased MDA levels but no differences in plasma selenium levels or GPx activity. GPx levels measured by ELISA were elevated in severe asthma. These results are consistent with an adaptive up‐regulation of GPx to protect against oxidative stress.